In 2010, hundreds of Kingstonians participated in the “Save Our Prison Farms” campaign to oppose the Harper government’s decision to close down the farm programs at prisons across Canada. Prison abolitionists related to this campaign in various ways. 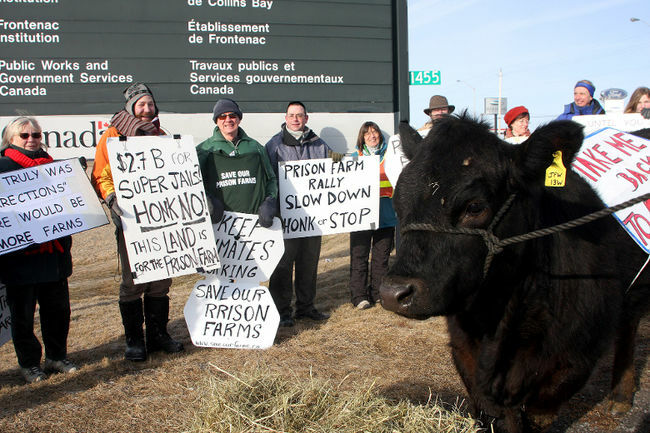 The campaign peaked in August 2010 with a 2-day blockade of Frontenac Institution in an attempt to prevent the prison farm cattle from being sent to auction. Since then, the campaign leadership has primarily pursued a strategy of lobbying opposition politicians, defeating the Harper government in elections and now urging the new Liberal government to follow through with its promise to re-open the farms. Under Trudeau we face a new political context on the federal level, and it appears the prison farms may in fact be restored. In early 2016 a call-out was circulated to prison abolitionists to reflect on the situation and contribute to this zine, asking the following questions: Is this a victory? What have we gained? What opportunities have we missed? How did or didn’t this movement strengthen our goals as prison abolitionists? How should we relate to single-issue or reformist movements? The result was a zine called Reap What You Sow: Radicals Reflect On Kingston’s “Save Our Prison Farms” Campaign, which is comprised of five diverse submissions and published by 613 Anarchy in Spring 2016. This event will feature short presentations from some of the zine contributors, followed by a facilitated discussion focused on the lessons of the prison farms campaign, and the sharing of ideas and perspectives on how radicals might relate to similar campaigns in Kingston in the future. I was a teacher in one of the local prisons for over ten years. I agree that there are absolutely huge problems with the prison system: the incarceration of people with mental health problems, people incarcerated when drug treatment is what is needed, lack of opportunities for inmates etc etc. However, I believe that there are some people who should be incarcerated for society’s protection. I wonder what kind of personal experience you have had with the prison system.